There are a lot of companies that use their own fast charging techniques, but Xiaomi has been sticking to Qualcomm’s Quick Charge technology on its phones. Now the company’s co-founder Bin Lin has posted a video on weibo that shows the company’s own 100W Super Charge Turbo fast charging technology. This shows a phone with 4000mAh battery charged fully in just 17 minutes. 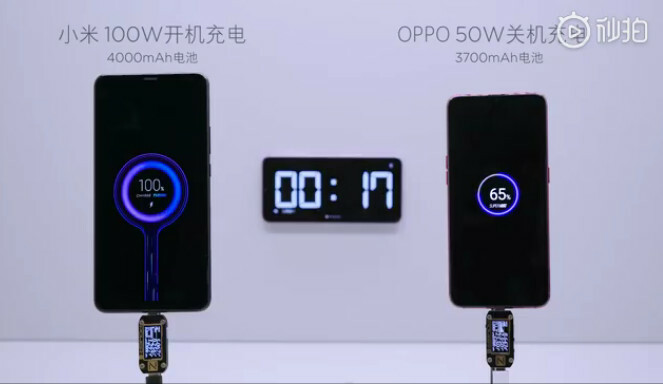 Xiaomi has compared this to OPPO’s 50W (10V/5A) Super VOOC Charging that charges 3700mAh battery up to 65% in 17 minutes. This was introduced as the world’s fastest smartphone charging tech that can charge the phone up to 92% in 30 minutes. HUAWEI introduced its 55W SuperCharge fast charging technology that can charge the Mate X’s 4500mAh battery from 0 to 85% in 30 minutes. Xiaomi’s new Super Charge Turbo technology is currently in testing stage and will take some time to reach the market, but OPPO’s Super VOOC Charging is already available in OPPO R17 Pro that is available in several countries globally.